Quality Improvement Project). 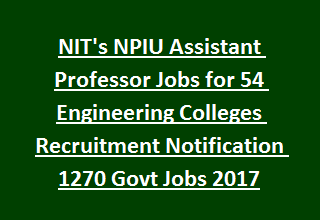 NPIU has released total 1270 Assistant Professors posts in various disciplines, which are given in the notification. Interested applicants having necessary qualifications, age limit and other eligible criteria are advised to go through NPIU official website www.npiu.nic.in to apply for these Assistant Professor jobs. This NPIU recruitment is purely on contract basis up to 3 years or up to end of the Project period. Application form link available from 30th October-2017 to 19th November-2017. NPIU selection committee will conduct Interview to finalize candidates for Assistant Professors jobs. Interviews will be conducted at 20 NIT Centres between 11-12-2017 to 15-12-2017 (Tentative). Application fee for the candidates is Rs. 500/- paid through online mode. Candidate will receive pay scale per month is Rs. 70,000/-. Maximum age of the candidates should be 40 years as on 19/11/2017. Detailed Description about Eligibility criteria, Subject wise/ state wise vacancies, Interview centres, Selection method, Application Procedure of National Project Implementation Unit NPIU Assistant Professor Jobs Recruitment are mentioned below. Available vacancies in National Project Implementation Unit NPIU Recruitment are 1270 posts. Name of the post: Assistant Professor: 1270 posts in 54 Colleges. State wise and Subject wise vacancies are mentioned in the notification. Bachelor/ Master’s degree in relevant branch from reputed institutes like IITs/ IISC/ NITs ets. PhD Degree in relevant discipline. Maximum age of the candidate should be 40 years as on last date of submission of application. Candidate will receive pay scale per month is Rs. 70,000/-. Non refundable application fee is Rs. 500/- paid through online mode. Selection authority of NPIU will arrange Interview to select candidates for Assistant Professor Jobs. Tentative date of Interview will be between 11th December-2017 to 15th December-2017. Candidate must bring their original certificates in respect of educational qualifications, GATE Score, Experience certificates, Date of Birth, Aadhar Card, PAN etc. to the Interview centre. Interview Centres: NIT Allahabad, NIT Warangal, NIT Bhopal, NIT Jamshedpur, NIT Nagpur, NIT Surathkal, NIT Calicut, NIT Rourkela, NIT Jaipur, NIT Kurukshetra, NIT Silchar, NIT Hamirpur, NIT Jalandhar, NIT Durgapur, NIT Srinagar, NIT Surat, NIT Trichy, NIT Patna, NIT Raipur, NIT Agartala. Interested candidates Read the detailed advertisement of NPIU before applying for Assistant Professors vacancies. Only online application forms are accepted. Open the recruitment page of NPIU www.npiu.nic.in. Find the post to which candidates willing to apply. Fill the application and submit from 30th October-2017 to 19th November-2017.